A knife without an edge is worthless, and most knives you find in pockets, sheaths, and kitchens are dull. Every edge you have, including an ax, should be able dry shave hair off your forearm and slice loose-held newsprint without catching. The most effective sharpener I know is also the easiest to use — just carve straight down on the V of slender stones, a stroke on one side, a stroke on the other. The stones are triangular, so you can use either the flat side or the angle (which permits sharpening serrated blades such as bread knives). 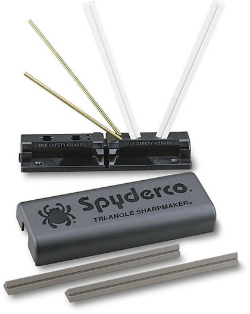 Spyderco has had the leading product for 20 years and now has a new improved “Sharpmaker” that looks pretty good.